Aperture Jam: "Tend to my Creations"
Ah It's so good to finally have a weekend where I can just tend to my creations, if only ever so slightly. I've had time to sketch up some designs for a new character today and over this Easter weekend I have been Cleaning Up some more of my short film. 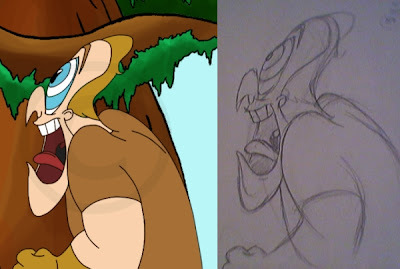 Above is a Clean Up colour render and the original pencil sketch which it was Cleaned Up from. This is just a quick render though, the colours and background will be different in the final form.